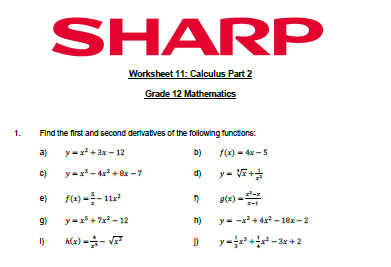 Worksheets for grade 12 students free to teachers to download once they are registered on the site. There are also fully worked out memos. All worksheets are free and follow the South African curriculum. They cover all the major topics in the South African NCS curriculum such as calculus, algebra, functions, trigonometry. New CAPS worksheets to arrive in 2014.